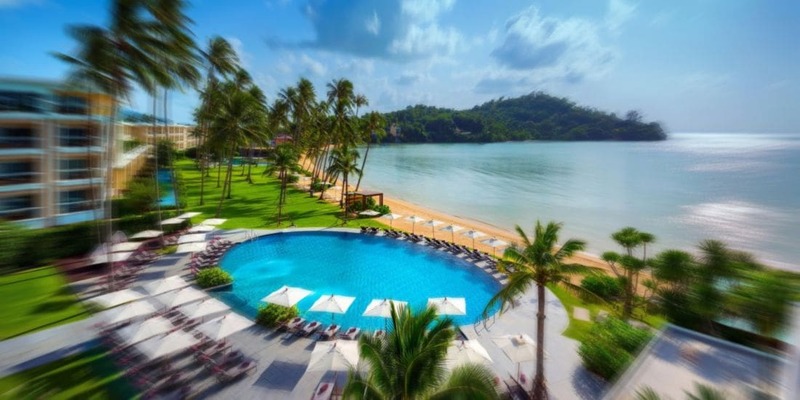 PHUKET: The recent bombings in Bangkok have not resulted in cancellations of hotel bookings in Phuket and the island’s tourism industry prospects for 2012 remain strong, the Phuket Tourist Association (PTA) has announced. Barring a “major incident”, Phuket can expect to have strong tourist arrival figures from both Europe and Asia throughout 2012, PTA President Jirayus Somboon told the Gazette. Sustained and aggressive destination marketing, including roadshows to India, has resulted in continued growth in the Indian inbound market, he said. To meet rising demand, Thai Airways International will launch twice-weekly direct flights between Phuket and New Delhi starting on April 15; and Phuket and Bombay starting on April 16. The recent bombings by Iranian nationals in Bangkok could have a small short-term psychological effect on tourist confidence in Phuket, but that the long-term outlook is positive, he said. The perpetrators were after specific targets and not members of the general population or tourists. People understand that such acts of violence can happen anywhere at any time, he explained. Nevertheless, Phuket province is complacent about potential threats. Knowing that any untoward events could do great harm to the island’s tourism industry, the province has stepped up security in key areas including popular tourist destinations and Phuket Airport, he said. Mr Somboon also called on the central government to shore up Thailand’s image among foreign tourists by getting the message across that it is a truly safe destination, not a target for terrorists. Locally, the PTA is teaming up with the Phuket Provincial Administration Organization (OrBorJor) and planning a series of roadshows, promoting Phuket as a year-round destination in existing markets and promising new ones. PTA members recently visited two cities in Taiwan in March the hope of increasing the number of Taiwanese tourists visiting Phuket from about 55,000 annually to 100,000. With financial assistance from the OrBorJor, PTA members will once again travel to the International Tourism Bourse (ITB) in Berlin in early March. July will see them embark on a three-city tour of Japan. In late September they will attend the PATA Travel Mart in Manila, then the ITB Asia event in Singapore in mid-October. Do you need help with your business? Are you searching for a new job? Or an employer looking to hire? Try JobCute today. At the beginning of the year Phuket’s tourism and hotel sector was cautiously optimistic after a strong first half of 2018 and humbling second half. Key terms that kept popping up were Mainland Chinese, Thai Baht Appreciation, Elections and Supply Concerns. According to data from hotel benchmarking group STR, Thailand remains Southeast Asia’s leading destination for Mainland Chinese, but the gloss is being diminished by Vietnam’s meteoric rise, and strong numbers by the Philippines and Cambodia. Market-wide RevPar shunk by 0.04% in 2018 and flat demand at the onset of the year is now shifting into negative territory moving into February and beyond. Turning back to last year, group demand is falling which is as key concern in a wholesale driven marketplace. One stark positive is that RevPar is being propped up by rates and not occupancy. A key takeaway is that in peak and high season, Phuket hotels are able to drive rates up in key periods and continue to do so. This of course is a broad trend. Good hotels tend to perform at higher levels, while poorly managed ones remain subpar. Getting beyond the numbers, as I speak to hoteliers the expectation is that wholesalers remain a critical component of the island’s hotel industry and despite the expected shift with technology to more direct bookings, the reality is that wholesale models are sensitive to demand volatility and the result of this feeding frenzy most often will be either flat rates for the year or in some cases a retraction. We expect the remainder of 2019 to be challenging. Some hotels will look at this as an opportunity to reposition, renovate or cut costs. While others will look at new segments, niche offerings or emerging markets like India to regain momentum. • Mainland Chinese – If tourism players or hotels believe the damage to Brand Phuket is over, think again. Talking to key tour operators there remains a hangover from last year’s boat sinking incident and travellers remain keenly concerned over safety. Only time and more concentrated promotion will see a return of the numbers. • Growing Supply and Demand Imbalance – The current pipeline is just over 8,000 keys in development on the island. What’s more concerning is that projects in planning are not represented in this metric, and by our estimate there are approximately 5,000 more keys in planning. While both the pipeline and planning numbers will see some wash, the sum total exceeds current and forecasted demand. Moreso, the rise of unlicensed condominiums, apartments, houses and villas is continuing unabated and is further exacerbating supply issues. Every time you see a group of tourists renting a 3 or 4 bedroom villa, that’s three or four hotel rooms that lay empty. 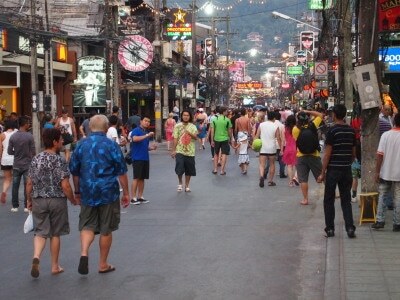 Government control of unlicensed properties is a key issue facing Phuket’s tourism industry. • Diminished Natural Resources and Strained Infrastructure – Water tops the list and there is little doubt we are reaching the tipping point with mounting shortages and soaring demand. Electricity is another concern. Lastly is a rising number of vehicles on the road, a urbanising trajectory and slow development of roads and public transport. To these point’s lets revisit the hotel development pipeline and reflect that a island long term master plan, zoning for new tourism expansion and requirements for developers to invest in public infrastructure to obtain operating licenses is sorely lacking. Something has to give on this front. In conclusion am I pessimistic about Phuket’s tourism and hotel future in 2019 and beyond? Absolutely not, direct airlinks are growing and the island has a well-structured capacity for handling tourism, but I firmly believe looking into our problems, discussing and finding ways to resolve these are critical to a sustainable growth pattern. A Thai couple has successfully set up a ‘Seastead’ near Phuket. Seasteading is aiming to build floating societies with “significant political autonomy”. Nearly half the world’s surface is unclaimed by any nation-state, and many coastal nations can legislate “seasteads” in their territorial waters (like a “homestead” but wetter). 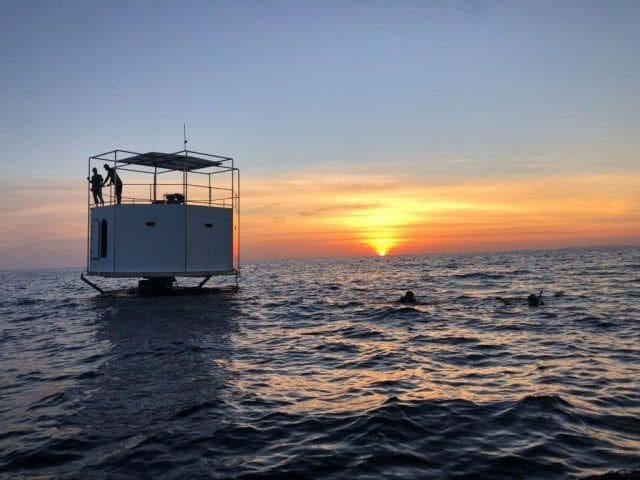 The nation TV reports that website ‘Bitcoin.com’ and ‘Ocean.builders’ report that the Thai couple Chad Elwartowski and Nadia Summergirl are are the first seasteaders who established a small seastead 12 nautical miles off Phuket. Most of the construction of the Seasteading was built on the island of Phuket. The installation in the sea started on January 9. 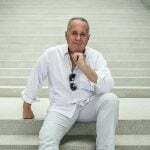 Mr Elwartowski reveals that the reason that they have chosen to settle near Phuket as the construction price is cheap. The sea is suitable for the establishment as waves are not too high and can attract many tourists. Thai developer K.W. 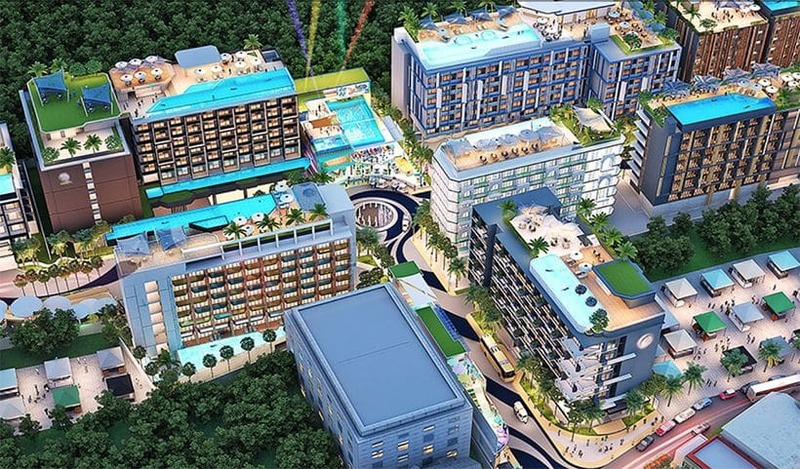 Plaza group has unveiled plans for a large-scale mixed-use project called The Beach Plaza on 15 rai, that will have 11 three and four star hotels with a total of 1.490 rooms. The developer is already pitching the unconstructed project to global hotel interests for an imminent sale. The properties will have varying room sizes from 25 to 35 square metres and range in size from 78 to 204 rooms. Part of the development scheme will see the hotels individually sold off to hotel investors and/or operators. Late last year the group built and sold the Surf Resort in Patong which was brokered by JLL to a Singapore-based owner/operator. Other components of the project include a surf club, waterpark, and freestanding restaurants and retail. An initial hotel has already obtained EIA approval and is currently for sale, with construction of other properties to be phased. 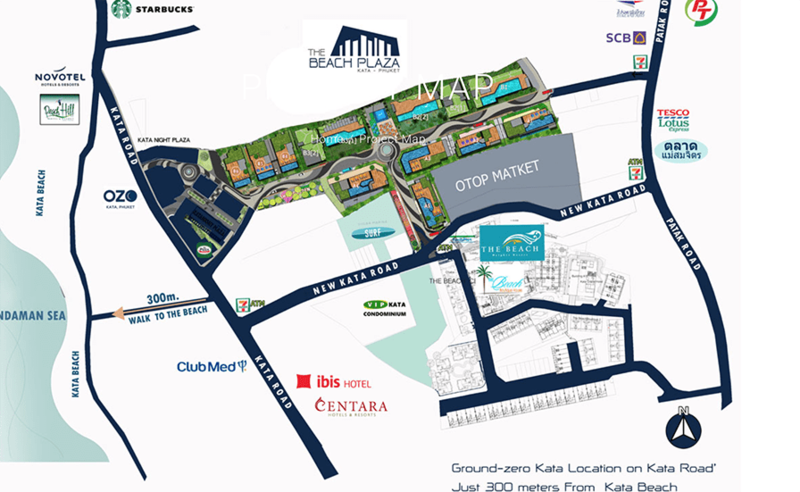 The Beach Plaza is off-beach, behind the Kata Night Market and close to Club Med, Ozo and the Ibis. For more details on the project click HERE.